Bookly Customer Groups add-on enables you to create and manage Customer Groups. Organizing your customers by type is extremely helpful for sorting, setting particular limitations and offering specials to certain clients. With Bookly Customer Groups add-on, you can arrange your customers in different categories and determine the rules for processing the reservation, for pricing, or displaying the services in the booking form. Create as many groups as needed. 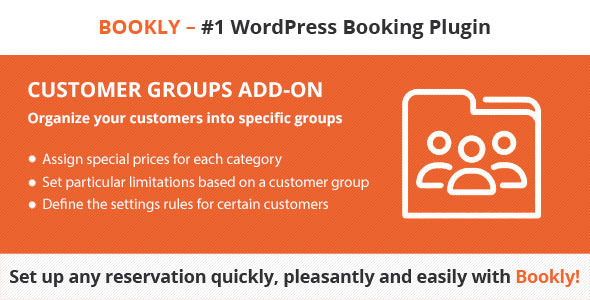 Easily set up and use the Bookly Customer Groups add-on with our detailed documentation.